Saints lock Christian Day has decided to call time on his career at the conclusion of the current campaign. Day has become an integral figure at Franklin's Gardens since switching to Northampton in 2008. He has racked up an incredible 226 appearances, scoring 16 tries in the process, and is currently in his testimonial year. Day enjoyed spells at Sale Sharks and Stade Français before making Northampton his home. And he has helped to bring plenty of success to Saints, winning a Premiership title, two Challenge Cups and an Anglo-Welsh Cup during his time at the Gardens. He was a key player in the sensational run to the Heineken Cup final in 2011, but arguably his best season came in 2013/14 when Saints did the double. Day was named players' player of the year, with his invaluable contribution recognised by his team-mates as Saints scooped their first Premiership crown and the Challenge Cup. But at the age of 34, Day has decided that now is the right time to hang up his boots and he will be taking up a role as player liaison officer with the Rugby Players' Association, of which he was chairman between 2014 and 2017, from July. “After 17 years of professional rugby time has caught up with me, but I am extremely proud to have contributed so much at Franklin’s Gardens in 10 seasons as a Saint,” said Day. “I have been battling an injury for some time which will unfortunately prevent me from playing in this season’s remaining fixtures, but I will be continuing to try and help my team-mates at Saints as much as I can until my contract is complete. “Thanks must go to so many people who have helped to make my time in this fantastic game so special. To all of the coaches, medical staff, backroom staff, supporters, friends and family who have supported me throughout my career; I am truly grateful. “My greatest memories in life have invariably been spent with my closest family, or on the rugby field. I am sad to leave the changing rooms behind, but hugely excited by my new role with the RPA. Saints chairman John White has paid tribute to Day. 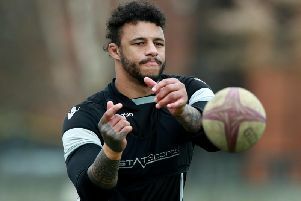 “Not many rugby players are able to give as much to one club as Christian has done for Northampton Saints,” White said. “He was almost ever-present throughout one of the most successful periods of the club’s history, and he will be missed immensely around Franklin’s Gardens.